Austin Manahan sent me some more great stories last night. (He also sent some scans for the cards in yesterday's post). 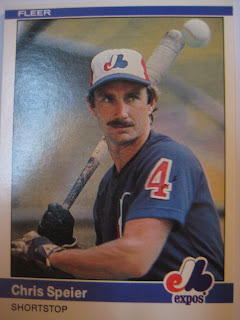 "My 1991 Bowman card was very disappointing. I finally saw it and my teammate Keith Osik is the guy in the picture. His picture and my stats...not a great combination for sure. We used to both sign the card for the autograph seekers. 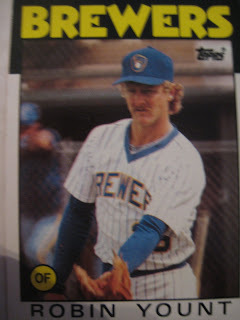 I used to carry around a Robin Yount card in my wallet a couple of years ago. I sold some furniture to him at La-Z-boy in Scottsdale and a few years later came across a card of his. Such impressive stats from guys back then that played at 170 or 180 pounds before baseball got BIG. 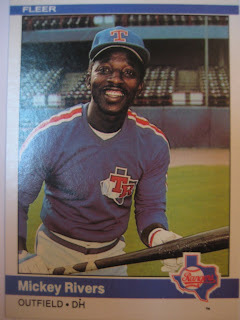 I have a Willie Wilson card that I have been looking at lately. 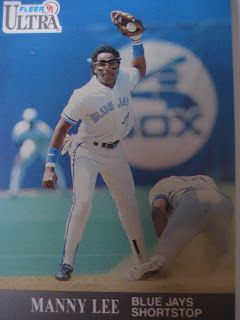 The guy is 6 foot 3, chopping ground balls off that turf and running like a gazelle on the old astro turf at Royals stadium... stealing up to 80 bases a year (no roids). That takes a toll on the body...take it from a part time base stealer who's legs were tired by June. That guy was impressive. No wonder the Royals used to make it to the playoffs back then. Sitting in the right field 'cheap seats' in Kansas City, my brother is having a discussion with the drunk sitting next to us. I guess the guy thought Fred Lynn was a pretty good player.Who were the Royals playing.. maybe the Angels? My brother Anthony (he's probably 12 or 13 years old at the time, I'm a year younger) is not agreeing with this guy. The guy pulls out $5 and bets my brother that Fred Lynn will hit a home run this at bat! My brother is not an idiot so he takes the bet. (try hitting a ball out of that stadium). Fred Lynn does not hit a home run, I think he popped up. Anyway, my brother won the 5 bucks...but on Freddy's next at bat he came up with the bases loaded and would you believe he hit a grand slam. 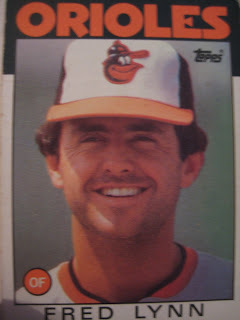 From that point on Fred Lynn sat just one seat behind Brett on my list of favorite left handed hitters. Do you remember when Bo Jackson took out Rick Dempsey at home plate? I noticed that Rick did not come to bat the following inning.. I knew he must have been hurting, it was a gruesome hit! Fast forward Probably a decade I'm playing third base for the Rancho Cucamonga Quakes in the California League.. we are in Bakersfield and low and behold Rick is the third base coach.. I had to ask him how it felt to be hit by Bo Jackson running full speed. He said that it wasn't as bad as it looked. So i asked him why he didn't come up to bat the next inning.... He said he broke his thumb on the play! (by the way he did hold onto the ball and Bo was out)." 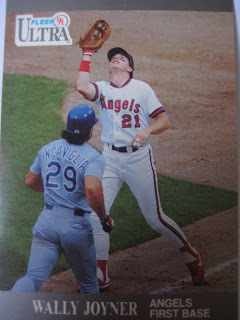 "I do have a favorite card...two that I actually really like...the 1992 Upper Deck...nice shot on the front. Also, they made a card (I only have one) in Australia for the ABL when I was there in 90-91 playing in their 'so called' league. I love that card also...great shot on the front. I remember the smell of the grass, the weather, the field etc...everything, like it was yesterday." He has also promised me some funny stories about cards from his minor league days as well as a cool story about how he got an autographed picture of George Brett's Pine Tar Bat (he grew up a Royals fan) so stay tuned! This card I got from Dinged Corners sums up a lot of what makes baseball great. 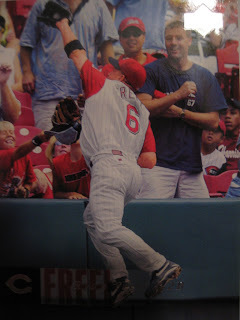 Not only is it a great action shot of Ryan Freel, I love the sense of wonder of the boy on the right, as one of his heroes comes close enough to touch, the adult fans happy to see a great play, and best of all the kid on the left, eyes closed, tongue hanging out, as he tries to catch the ball with his hat. The most interesting card in the four packs of Ultra I got from Cards on Cards was this Gary Sheffield. 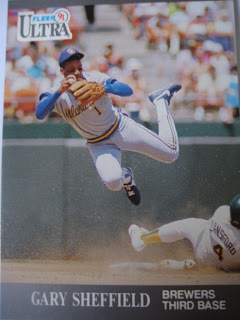 Though listed as a third baseman, he is clearly a shortstop on this card, albeit an awkward looking one as he fails to turn the double play courtesy of a hard slide by Carney Lansford. 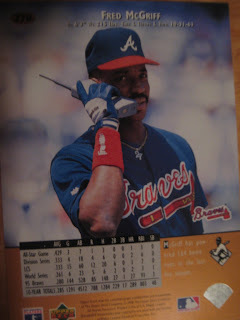 Interestingly, even though it is a 1991 Ultra card, Sheff didn't play a game at short in 1990. Instead, this picture is from May 14, 1989, a 2-1 Milwaukee win at Oakland - this play occurred in the second inning. Sheffield would go 1-4 and scored the winning run in the ninth on a Glenn Hubbard error. 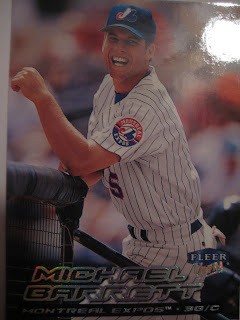 There was no Fleer Ultra in 1990, which makes one wonder why Fleer held onto this photo for an extra year instead of using it to spice up the oh-so-boring 1990 Fleer set. Were they holding on to great pictures in anticipation of launching Ultra the next year? Or did they not get the picture until too late for the 1990 set? Greg Litton played six years in the major leagues, from 1989 to 1994. In the 1989 postseason, he hit a combined .571 against the Cubs and A's with a homer and three RBI. Since his retirement from baseball, he earned a post-graduate degree in diamond grading and appraising from the Gemological Institute of America and is currently General Manager & Diamond Appraiser at Meadows Jewelers in Pensacola,FL. He is also a public speaker with Studer Group, a leading health care consultancy. He kindly took the time to answer my questions about baseball cards. Do you have a favorite card of yourself or of another player? 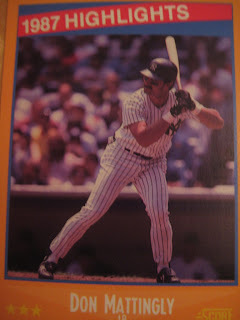 My favorite card is one of my rookie cards that shows me kneeling with a pair of red Franklin batting gloves on and a Chris Speier bat in front of me because that was my first day in the Big Leagues. Do you collect baseball cards? No I do not collect baseball cards. As a child, we used to buy them, chew the gum and then clothespin them onto our bike tires for the noise. 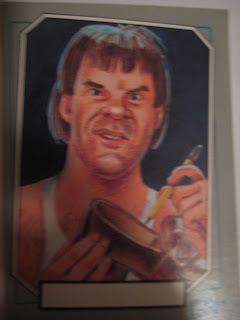 Do you have any stories about cards of yourself or of other players? 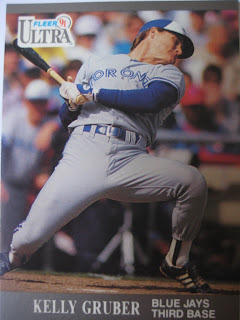 I don't have many of my cards but there is one of cards (early first or second year) that has a quote from Jack Clark on the back. He was one of my favorite players and I give him credit for getting me to the big leagues as I copied something from his hitting style that really helped me. So that is pretty cool. Thanks! I don't have the card he is referring to here - I believe it is either 1989 Score Traded or 1990 Score. Do any of you readers have that card and can confirm? Litton's major league debut came on May 2, 1989 at Candlestick Park against the Cubs, a 4-0 Giants victory. 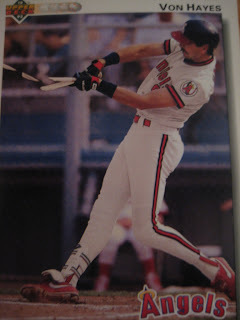 In his first major league at-bat, he struck out against future Hall of Famer Greg Maddux, but later reached base after getting hit by a Maddux pitch in the sixth. In my contest winnings from Cards on Cards, I got four packs of 1991 Ultra. 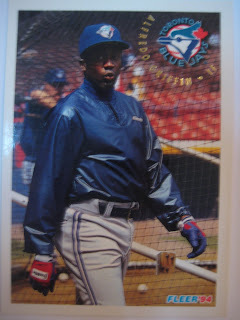 This was not a set I particularly cared about either way, just another early-90s baseball set. However, getting this many at once made me really look at the set for the first time, and I find that I really like it. The gray borders are nice and understated, and the focus is on the photography, which is very crisp-looking and contains a lot of angles and images you didn't often see on cards in 1991 or earlier. 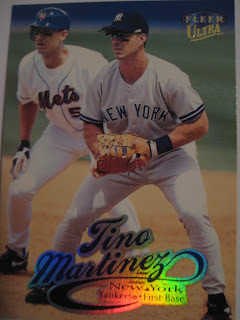 The card I liked best in my winnings from Cards on Cards was the 1999 Ultra Tino Martinez, which features action from the one day game in the three-game Subway Series at Shea Stadium, June 27, 1998. The Yankees won that game, 7-2, with the Bam-Tino hitting a big three run home run to give the Yankees a lead they would not relinquish; the ball landed a deck below where I was sitting in right field. The baserunner is John Olerud, he reached base just once in the game, hit by an Andy Pettitte pitch in the top of the third. 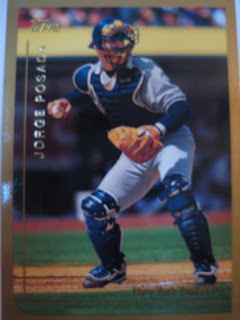 One thing I remember from that game was how the Mets big-name catcher was in the midst of a big slump, while the Yankees unknown catcher had a great game, leading the Yankee fans to chant "Posada's better than Piazza." At the time it was solely to rip on Piazza, who at the time was doing worse than Joe Girardi's backup, but amazingly over the last twelve years Jorge has at least worked himself into the same league as top catchers of the 1990s/2000s. I recently won part of the Cards on Cards bowl games contest, and got my winnings this weekend. Part of the winnings were a bunch of packs of "junk wax" - four 1991 Ultras, a jumbo pack of 1990 Fleer, two packs of 1989 Topps, and one pack each of 1988 and 1989 Donruss. 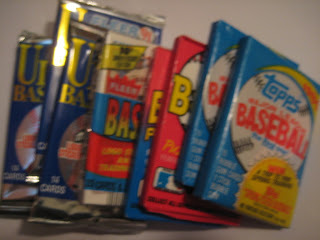 I still have a lot of needs for 1991 Ultra so I was glad to get a lot of packs of that set, same thing with 1990 Fleer. 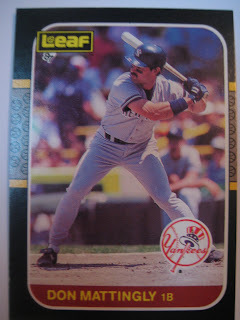 I was pleasantly surprised that there was a card in 1989 Donruss I didn't already have, I now just 11 left in that set. 1988 Donruss and 1989 Topps I already completed but I couldn't resist opening those packs just for fun. Anyway, if you have any needs for those sets check out the tradelist on the top right of this page. 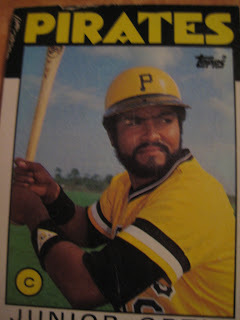 (SpastikMooss I already checked your 89 Topps list, no luck. 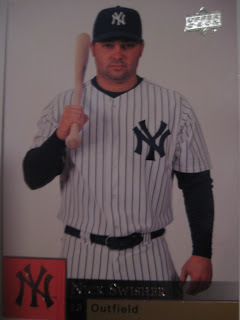 There was also an awesome stack of recent Yankees cards, which was awesome because I needed almost all of them. 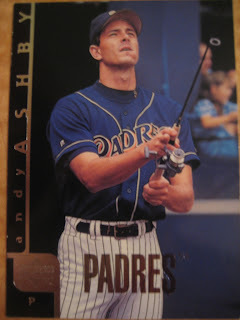 Believe it or not, this Swisher is my first 2009 Upper Deck card - just hadn't gotten any up until that point. Honestly, it's not my favorite card design. 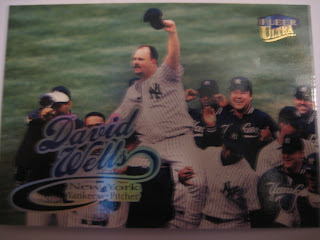 I think the 1999 Ultras are just a great set - this David Wells card is just fantastic. There was one that was even better, but that's going to get a separate post of its own. Tom House pitched eight years in the major leagues for Atlanta, Boston and Seattle from 1971 to 1978, going 29-23 with 33 saves. His best season came with the Braves in 1974, when he went 6-2 with 11 saves and a 1.93 ERA, yet his most famous moment that season came when, sitting in the Braves bullpen, he caught Hank Aaron's record-breaking 715th home run. Since his retirement, he earned a Masters and PhD in sports psychology and became one of the most successful pitching coaches in the country, most famously working with Nolan Ryan in Texas. A co-founder of the National Pitching Association, he is the pitching coach for the USC Trojans, one of the country's best college baseball progams. He kindly responded to my request for his thoughts on baseball cards. My first Red Sox card. Topps photo shopped Red Sox uniform and hat over Brave uniform and hat before Photoshop was a technology! Result speaks for itself!! All my cards are my favorites. Just glad I have a few in circulation but no, I do not collect cards." 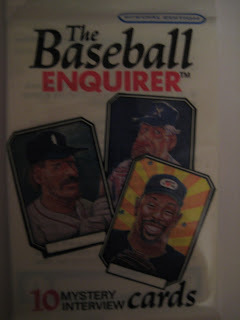 There was also an unopened pack from a fun set called "Baseball Inquirer." 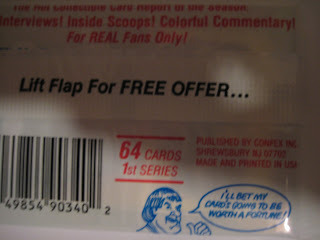 The back has a quote by Pete Rose - "I'll bet my card's going to be worth a fortune!" Well, according to Baseball-Cards.com, it's only worth $1.50. I guess Rose lost that bet. 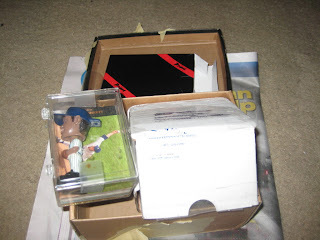 There were far too many cards to show them all, so here are some cards that best capture my mood on opening this box, plus one of the greatest hats in baseball card history. 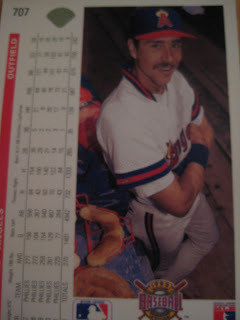 In my trade with SpastikMooss I wrote about it the other day, I got more McGriffs than just the dozen 1990 Donruss's, as he has more cards of him than probably any other collector, and so has a lot of doubles to get rid of. 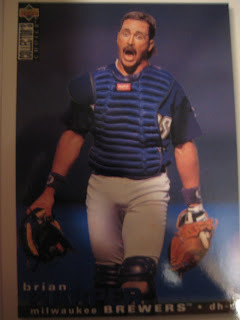 The nicest one in my opinion is this 1996 Upper Deck card. The back, with the old-technology cordless phone, is definitely fun. 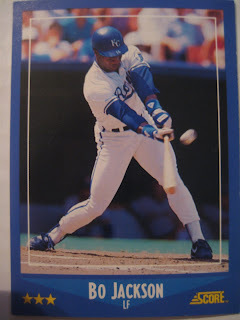 But the front has a really awesome action shot, showing McGriff stretching out all six feet, three inches behind the base line to corral an errant throw, easily beating the admittedly slow-footed Todd Zeile. Not a lot of cards show plays at first base, especially a difficult one like this. Denny Hocking played 13 years in the major leagues; 11 years for the Twins, and one each for the Rockies and Royals. 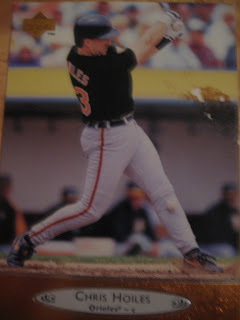 Now the Field Coach for the Frederick Keys, the Orioles High-A minor league team, he kindly sent me his stories on baseball cards. 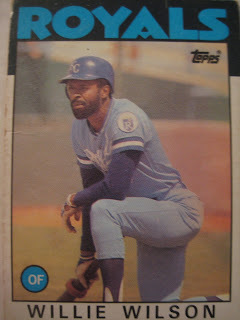 "Only story I have is I think my KC card is someone else. No other specific memories about them other than my daughter has a pillow with all my cards in it. I collected them as a kid but not now." Thanks! 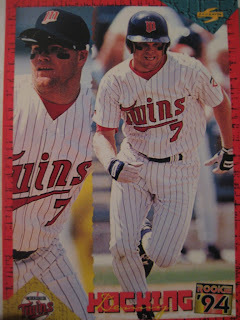 I couldn't find a picture of the card he was referring to (2005 Omaha Royals Multi-Ad #11) but here is a picture of him with the Twins. 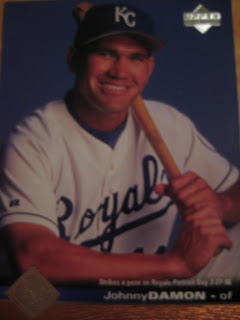 If anyone has that Royals card I would be interested to see a picture of it to figure out who it really is. Front: Most pieces of a broken bat visible on card? Back: Most catchers masks in a picture with no catchers? Who is Alfredo Griffin wolf whistling at? 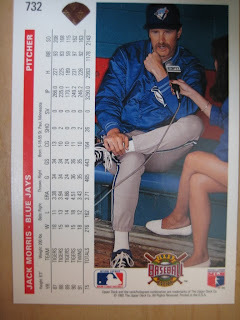 Maybe it's that pair of legs interviewing teammate Jack Morris? I see she works for ESPN. Hope she remembered to wear some pants around Steve Phillips and Harold Reynolds when they joined the network. I went to the card shop yesterday because I was in the mood to get a few new cards. I got two 100-card boxes for $5 each and a 10-pack of Yankees for $1. 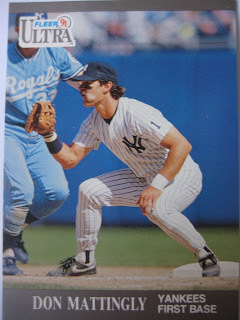 I picked a Yankee pack with a 1987 Leaf Don Mattingly on it because I knew I didn't have it, but it turns out that I had all the others! 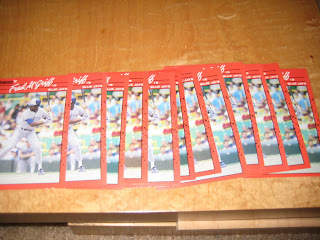 I did better with the larger boxes of randomness, with favorites of mine like Jorge Posada and Mickey Rivers. 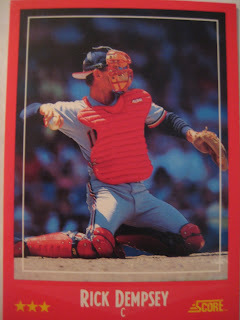 There were a lot of 1984 Fleer, which is a set I love and don't have a lot from. 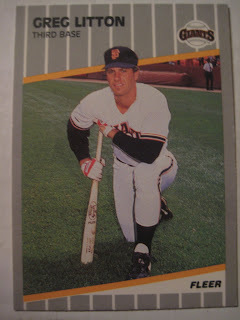 So many of those cards just look so great, like this one with Chris Speier. 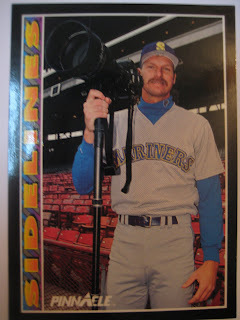 One more great shot, this one of Randy Johnson, photographer. Is that a bat in Will Clark's pocket? Yes, it is. But I'm sure he's also happy to see you. That pocket is never going to be the same though. 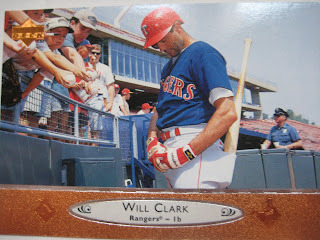 I wonder if there are any other 1996 Will Clark cards that show him with a saggy back pocket? Other highlights on this card include the cop with two-fisted coffee-cup action and that every fan is wearing jean shorts - hey, it is 1995. 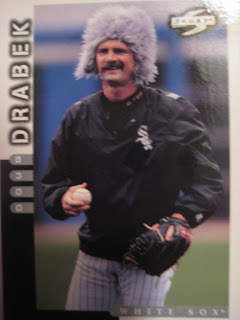 Sometimes weird objects make it onto baseball cards, but there's usually a reason. Player is riding a tractor? Probably used for field maintenance. Using a water gun? To cool off the fans. Holding a surfboard? To advertise for the photographer's brother. But how does a fishing pole get on the field? Maybe someone was using it to dangle a card for Ashby to autograph and it fell onto the field? 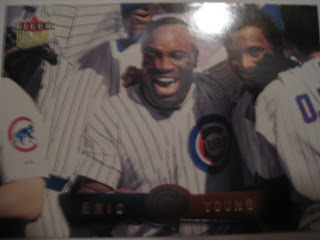 Back in August, I first traded with SpastikMooss of Great Sports Name Hall of Fame. That seems to be the beginning of a beautiful friendship, as we have now traded cards four times in the last five and a half months. This time, he sent me some cards in "this size 5 children's shoebox that I took home when I used to work at payless many years ago that has held a video camera, my prized baseball cards, and a digital camera at different times over the years". First off, before Thorzul falls asleep from this trade post, I got Bipped! 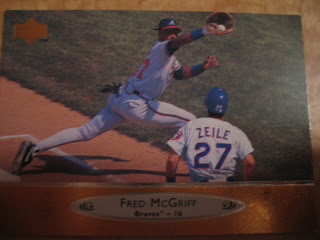 Twelve 1990 Donruss Fred McGriffs! Don't worry, SpastikMooss, you're going to get an even bigger Bippage from another card in that same set, coincidentally. 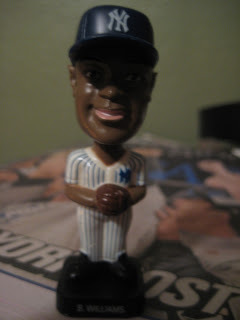 This is my first-ever bobble-head doll. Apparently it is supposed to be Bernie Williams but it sure doesn't look anything like him. 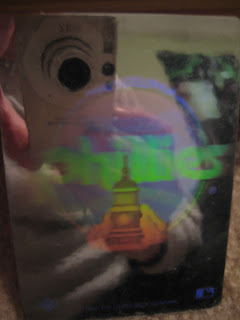 Lots of shiny Upper Deck stickers - I love these! Lots of current Yankees like A-Rod and Damon (hope he stays a Yankee). Johnny sure looks cocky for someone who at the time only had 47 major league games under his belt. The vast majority of cards he sent me were perfectly mint. However, he knows I'm no condition snob and sent me some fun used-and-abused cards like Junior Ortiz run over by a car and Chris Hoiles with coffee stain. 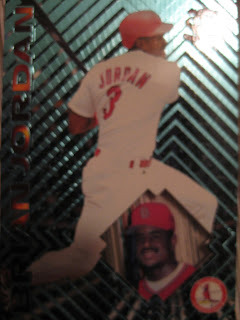 Those of you with cards like this and want to get rid of them I'm always up for trading for more of these! I'll even send mint cards in return!